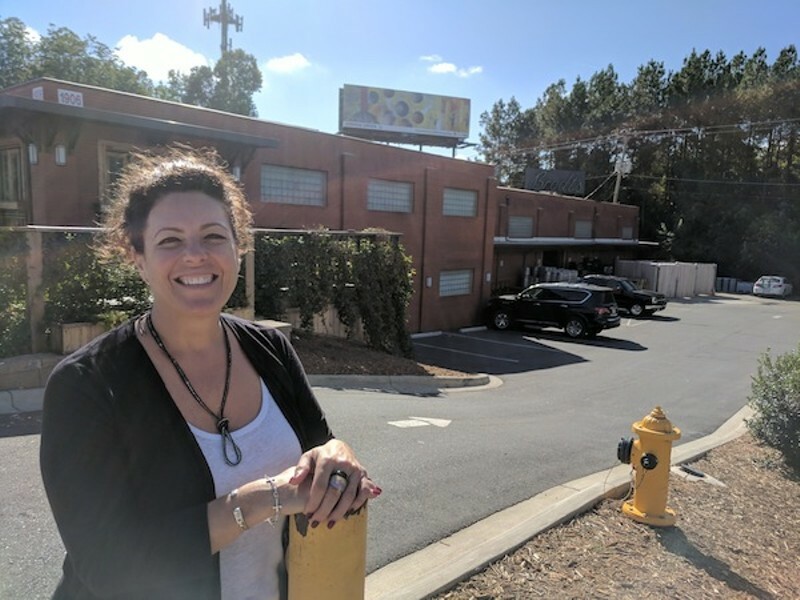 Speaking with Wendy Hickey, executive director and founder of ArtPop, at Nova's Bakery in Plaza Midwood on a recent morning, her passion for local arts, like her billboards, is hard to miss. She gets excited just to speak about the program, which highlights the work of local artists on billboards and in other public spaces, and gets emotional when telling the story of Owens Daniels, an ArtPop alum from Winston Salem who was able to quit his day job and do photography full time thanks to the exposure he got from ArtPop. "That's just the best thing in the whole world," Hickey says, tearing up. "So I get very, very emotional about this project because it means everything to me; to change an artist's life that way, I can't even talk about it." Hickey used her connections made over an 18-year career with Adams Outdoor Advertising to build up the program. 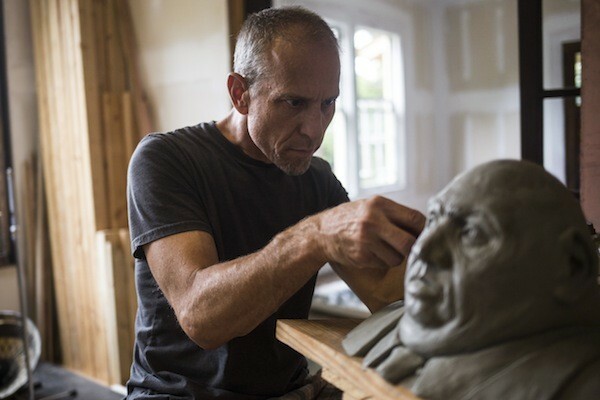 In the last three years, ArtPop has showcased 80 Charlotte artists in Mecklenburg and 10 surrounding counties, as well as 125 more in 13 other cities nationwide. 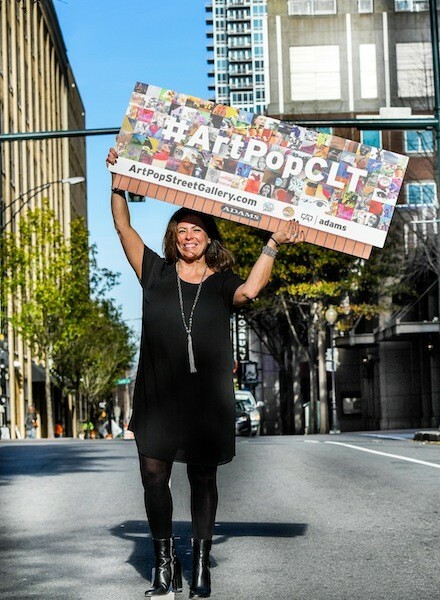 The call for 2018 artists ends October 15, so Creative Loafing chose to sit down with Hickey to chat about what ArtPop means to her, and what it means to Charlotte. Creative Loafing: How did this idea formulate? Wendy Hickey: In 2002, I was serving on the Board of Directors for the Pocono Arts Council in Stroudsburg, Pennsylvania. I really wanted to commit to my position on the board. 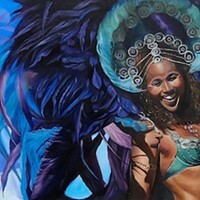 I wondered, how could I truly serve the local artists in my community through my board position? I was like, "Wendy, you sell billboards. Get your artists some billboards." So I went to my boss and said, "Hey Karen, can I give artists in my community billboards when they're not sold?" She said, "Sure, go do it." So we started exploring this in 2002 exclusively at Adams. And then as I traveled around — working for them for 18 years I moved five times. Each time I moved I would repeat this program. So unofficially — not known as ArtPOP — we were in Illinois, Michigan and Pennsylvania. And then I was living in Michigan and moving to Charlotte, and decided, I'm not playing around with this anymore, I'm going to get serious. How have you been able to grow so rapidly? 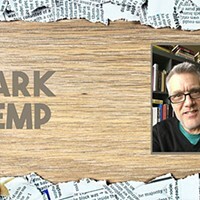 My background is 20 years in selling billboard advertising. That's what I do. The outdoor advertising world, while it's a massive animal, it's still a very small world and we all know each other. So all the companies — Adams, Lamar [Advertising], Clear Channel [Outdoor], all of them — we're all related through the industry. So I have tremendous connections that have opened doors to allow us to have these relationships for people who want to donate space to us. And you've expanded in Charlotte, as well. You're not just on billboards anymore, right? An ArtPop graphic currently on display at Charlotte Airport. The beautiful thing that's happened this year: the artists in 2017, when they entered the program, they were promised a billboard for an entire year, [and] in addition to that, they ended up getting not just their billboard, they also got the news rack for six months, they got a digital billboard in Ballantyne Village, and now they're also at the airport. They had no idea that was going to happen to them. I'm working on their behalf at all times to expand and improve the program to give them more. But Adams has always been our solid. They have promised us 20 billboards somewhere in this Charlotte region for an entire year, 365 days a year. They're amazing. Any plans for other types of expansion? I'm looking at this program, how to expand it and improve it, and I think walls would be the game-changer for us here in Charlotte. I am in conversations with different folks here about how we can make that a part of the program. 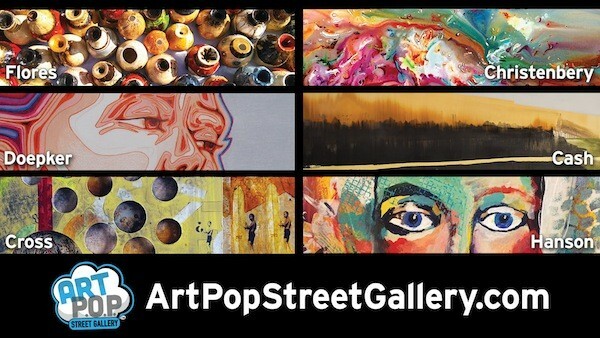 When that is going to happen is always the question, but that is very top of mind, and ArtPop Street Gallery, to add walls and murals to the program. We feel like we've earned the right for dignitaries and people in charge of property and those types of people to trust us. We've built a beautiful brand here. They know we're going to come from the right place and do the right thing for our city, so yes, yes, yes on walls. So going back to the billboards: It's not just visual arts in the sense of, say, paintings that are featured, correct? We look for diversity in disciplines, because what we don't want it to be is a program that only has paintings in it. We really want it to be a diverse group of disciplines so that everyone gets in. We've had fabric artists, we've had wood artists, we've had glass artists. How do you work mediums like that into a billboard? Everything is photographed. Even if it's a painting, it's still photographed. So what people need to be prepared for is to have someone great at graphic design who understands the specs of the rectangle. Because if you are using a piece of art that you already have created, you're going to have to make it fit into a rectangle, which means you're going to have to crop your work. So sometimes when you see some of the paintings, let's say it's somebody's eyes, it's actually a whole person, head to toe, and you only get to crop a part. A lot of times, fine artists who aren't used to graphic design and switching something over like that, they just can't fathom, "How do I do this?" So we're trying to make it really simple and show people how. What's the feedback been like from alums? The feedback has been phenomenal. Artists are getting more opportunities; they're collaborating together, they're opening galleries, they're able to charge more for their artwork. Some of them have been able to transition from whatever they were doing during the day and become full-time artists. The payoff, as far as what I've been getting feedback from, is all good, all positive. What sort of obstacles have you run into in this process? The obstacles have been time and resources, because we're not funded enough for me to be 100-percent laser focused on this. We've had tremendous growth over the last two years, so what we're looking to do now is truly stand on our own feet to where we actually have staff. Because we're currently run all by volunteers, and I'm so grateful for all of our volunteers and the ArtPop Board of Directors. I'm a volunteer executive director and founder of ArtPop. We want to change that, and we want to be able to raise enough funds that we actually can hire myself and someone else as a staff member and then grow the staff in the future so we can really become laser focused on this program and just rock it. So funding is an obstacle, and getting to the point where we have a staff. To me, that's a huge obstacle, because if we have done what we have done as a volunteer organization, can you imagine how we could impact artists' lives if I was laser focused? Do you have a goal for a timeline as far as creating a staff and doing this full-time? I would like to make that happen within the next six months to a year — 2018 should be our year. How did you become so passionate about this project? Are you an artist yourself? I do a little bit of photography, but it's nothing that I share with the public. It's just my thing and I like to go around doing that. But in my career in marketing and advertising, I'm always pushing clients to do better, more creative things so the billboards aren't boring and they're impactful. I've always been a salesperson with a huge artist's heart, so if you couldn't find me with a client you could probably find me in the art department at work. I like to collaborate with the artists and build the best campaigns. 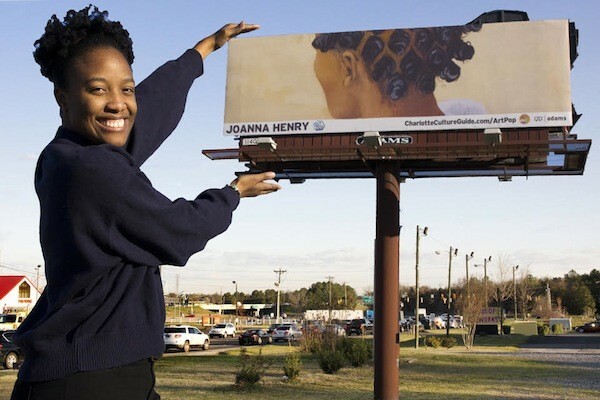 Rock Hill artists and ArtPop alum Joanna Henry poses with her billboard in York County, South Carolina. I've always been drawn to artists as human beings — they're my people, that's who I want to spend time with. Over and over again I would hear from them; they have this beautiful craft with whatever it is that they do, but they don't know how to market themselves. And that's my gift, I'm good at that. And so I thought, you know what, dammit? I'm going to help them all. I'm going to help as many of them as I can. I'm going to give them a voice and I'm going to give them advertising space and I'm going to make sure that people know in their own backyard who their artists are and stop buying stuff from other places. Go to the artists and get the work from them. That's what it's all about. So it's really just love, a big love. Wanting to help "all of them," as you just said, is it tough going through that selection process with your panel? It's brutal. It's really hard for me because I'm so emotionally attached to helping all of the artists. When you get like 200 submissions or 150 submissions, and you've got to take it down and take it down and take it down to 20, it's just brutal. There's always one every year that I am going to fight for. I'm like, "This is going in, and I'm going to make this happen," because you know what it's going to do for somebody in their car or riding their bike or walking; you just know it's going to be so powerful. Usually I have one of those every year in every city that I'm just like, "That's going in." But it's super hard to make the decision and to know that so many people put their heart into this submission and they're not going to get chosen simply because we don't have the space for them. So those artists should definitely reapply. So artists should definitely apply, or reapply, by October 15. 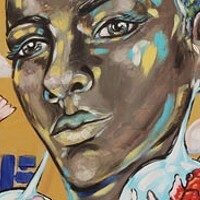 Any way for non-artists to get involved or help the cause? I have this incredible opportunity right now. Two weeks ago today, I found out that I was nominated in a humanitarian contest that will provide $50,000 to ArtPOP when we win. All you have to do is vote. That's it. There's a company called Eagle Rare Bourbon that does an Eagle Rare Life Award. They do a feature article on about 106 different humanitarians, and there's a place to go on that link, and all you have to do is click Vote Now. You don't have to give any information, don't have to fill any forms out. But the vote lasts all the way from now until December 5th. And you can vote once every 24 hours, and I need everyone who reads your publication to commit to that and do that, because if we could gain this $50,000 ... game changer.